RAVENOL Expert SHPD 10W-40 is a easy running engine oil for the use in heavily used induction motors, turbo diesel engines as well as petrol engines. 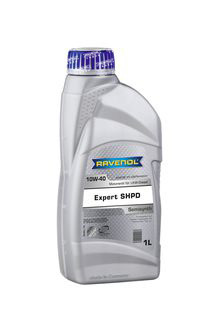 RAVENOL Expert SHPD 10W-40 is suitable for the use of a mixed car pool. The mixture of unconventional as well as HC basic oils, synthetic components and modern additives guarantees longest oil change intervals and a high corrosion protection at a low oil and fuel consumption. RAVENOL Expert SHPD 10W-40 has an excellent flow behaviour even at low temperatures. The quick reach of critical lubrication points provides a considerable corrosion reduction during the warm-up period. Exclusive additives guarantee the best engine cleanness even at short distances. Excellent detergent and dispersant characteristics. Protection of reflecting surface formation. Very good cold start characteristics. Reduces oil and fuel consumption.